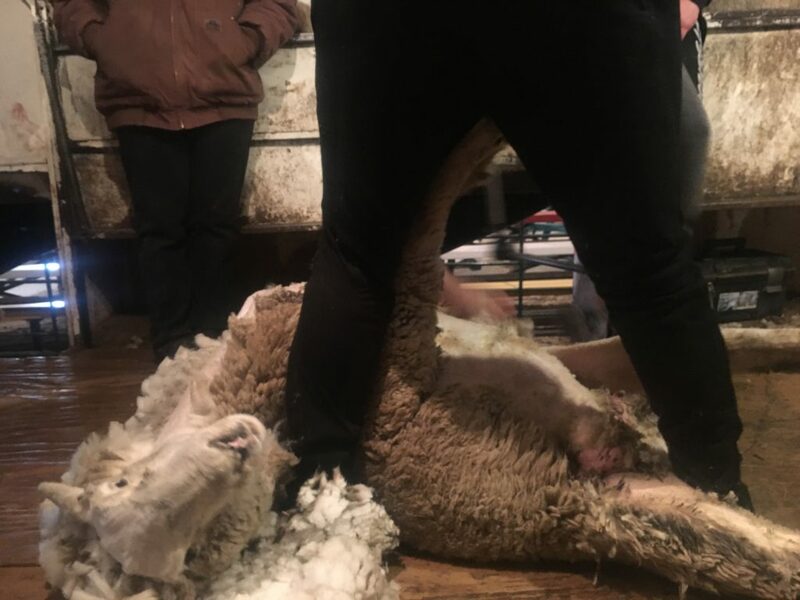 I attended Advanced Shearing School with Australian shearing guru Mike Pora from January 28-30, 2019 in Newell, SD, and thought other shearers might benefit from some of what I learned. I took this class for a few reasons. First, as shearers are known to say, “If you’re working too hard, you’re working too hard,” and I am working too hard. 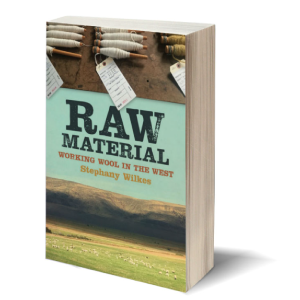 Second, I wanted to learn more about shearing fine wool sheep, which are rare on the West Coast; I shear mostly crossbreeds, or non-fine wool breeds. Fine wool sheep in the US are found in Nevada, Montana, Wyoming, the Dakotas, etc. Finally, I often work alone and not on crews with expert shearers who can teach me things. As a result, I develop my own shearing adjustments and bad habits, of both the conscious and unconscious sort. I need eyes and expertise outside of me to help me learn and do better. And it sure was a good excuse for a vacation with the lady shearers you’ve only met online. We were in a Vogue article together and now we’re friends. 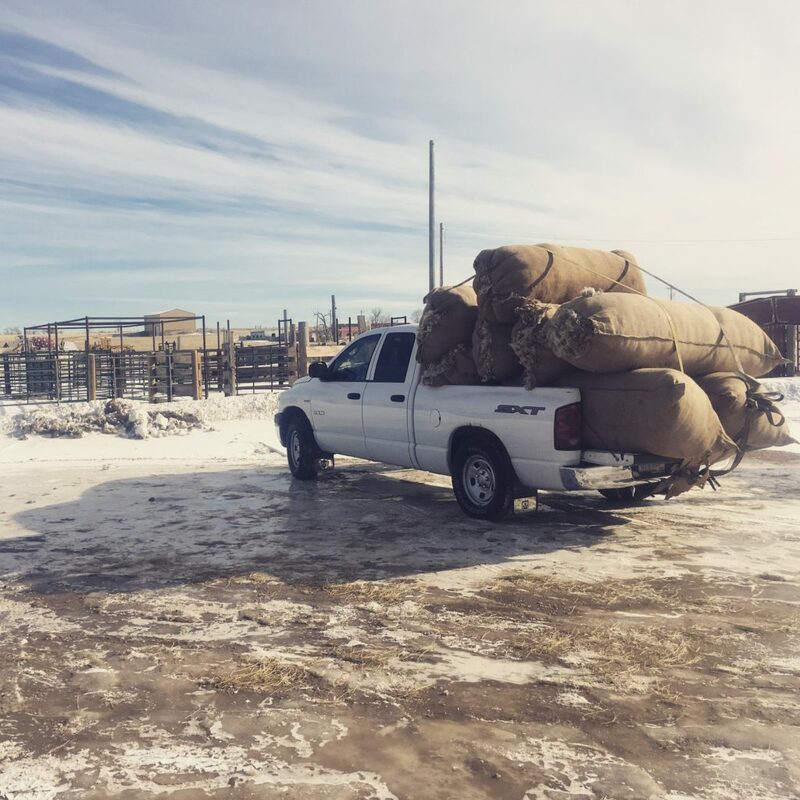 In regard to working less hard, and doing everything we can to ensure we can shear as long as we can, Mike taught us footwork and positions to get the sheep to hold more of its own weight, and to get that weight off of our legs and knees. People think shearing is hell on our backs, and it can be, but my knees, quads, and hamstrings take the brunt of it, because those hold the sheep. Brisket over teats. Spine behind. A few things to note in this photo: The sheep is holding its own weight, comfortably shifted onto its right hip (not its tail, which sheep hate). Mike’s left knee is over the back of the sheep’s neck, and the sheep’s spine is behind Mike’s calf. When standing this way, you can feel the sheep’s spine behind your left leg, their back bone leaning against your leg bone. The difference is that your left leg is not required to hold the sheep and prop it up. Your leg braces and grips the sheep, but does not support it. After feeling the right way to do this, I realized that I often have the sheep’s spine on the wrong side of my leg, supported by my front shin, with my left knee holding up a substantial portion of the sheep’s weight (no wonder that knee is the crackly sounding one). Altogether, this meant that, while shearing the sheep’s first hip, I was supporting the sheep’s weight with my left knee, while also bending forward in half to reach over to the tail. Not fun, and so much harder than it needs to be. 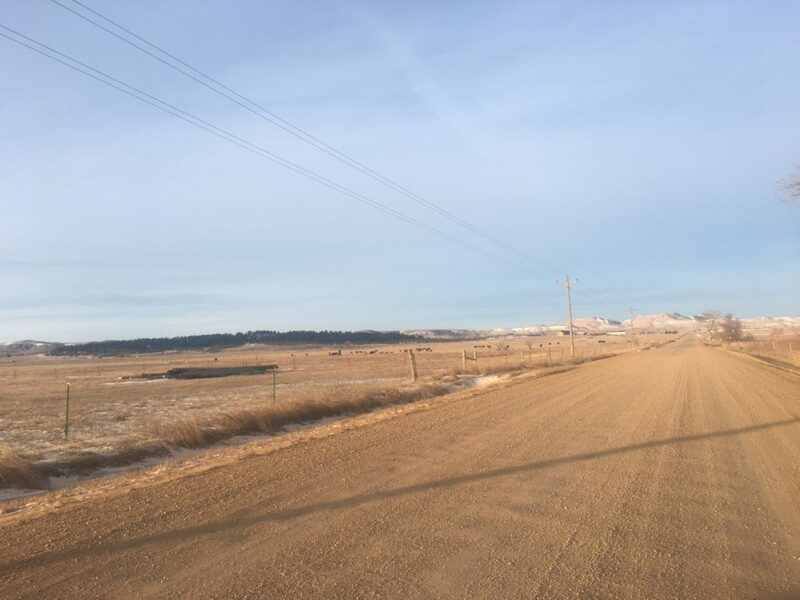 We learned this lesson in the first hour of the first morning so, very early on, I had already learned something valuable that will make my life substantially easier, and prevent injury, wear, and tear. “This class doesn’t cost enough,” I thought, and I meant it. But there’s something more going on in this position, too. Notice how the sheep is angled, almost matching the angle of Mike’s foot, which is not straight but pointed outward from his body. Mike is looking down over the sheep’s hip more than its belly. When shearing the belly, crutch, and first hip, many of us are oriented more directly over the sheep’s belly, in a straight line, and not at this angle. 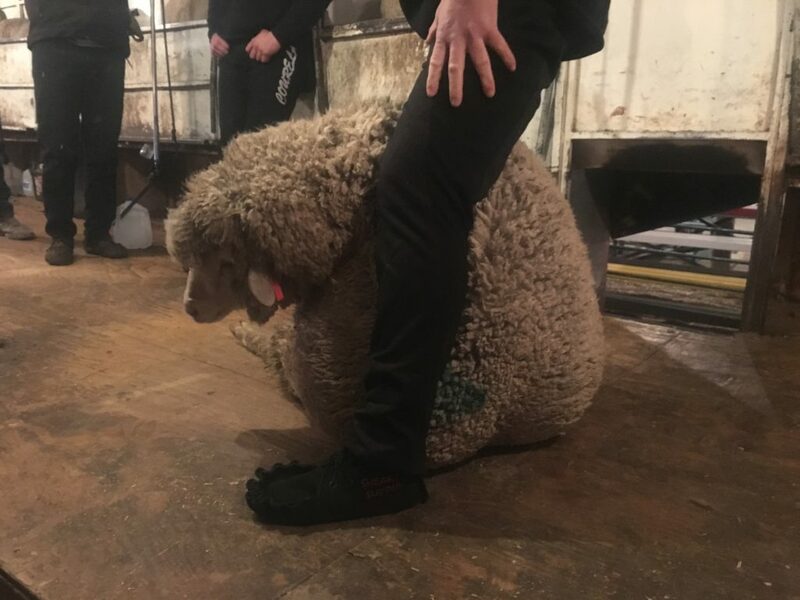 This brings me to another big lesson: crutching when the sheep’s weight is situated more like this, and not just when fully laid back as they can be during belly shearing. It was, initially, a bit mind-bending to look down and see the sheep’s crutch area less open and a bit more tilted, with its rear, left leg resting into the crutch area more than unusual, but crutching was still possible, safe, and made the transition from the crutch into the first hip much easier. As for getting the sheep to hold more of its own weight… When I learned to shear, I was taught to have my right knee turned in to the right side of the sheep’s brisket when shearing the first hip. This meant my right knee ended up holding the sheep up at the brisket, not just bracing it but preventing it from slumping over to the right side. By copying Mike’s moves, the sheep supported more of its weight, required less of my leg pressure in the brisket and, combined with the sheep’s spine sitting behind my left leg, made for a much easier shearing of the first hip. The above photo may look like a typical one of shearing the first hip, but let me tell you about what Mike’s left hand is doing (and does next). Because the sheep is stable and holding a good bit of its own weight, Mike can really pull the skin on that leg juncture and hip right up toward him (not just rolling it toward him, but pulling that hip more up than over). 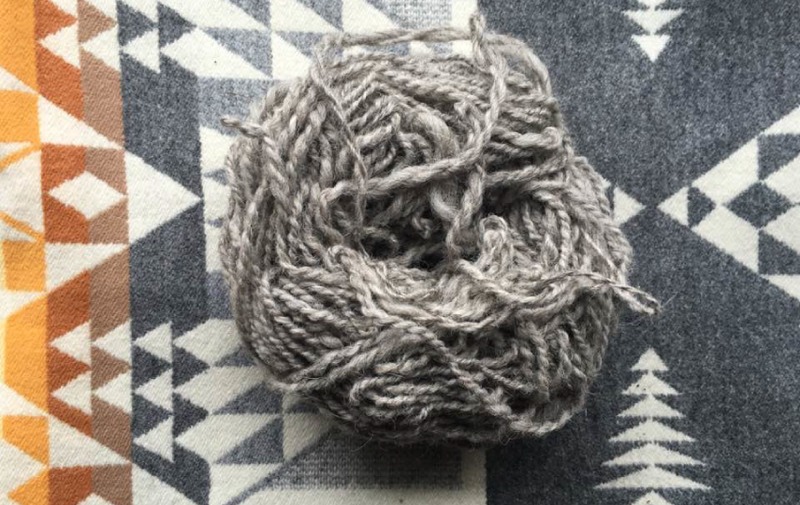 This makes the skin taut on these wrinkly fine wool sheep, for a clean, nick-free hip of nice wide blows. 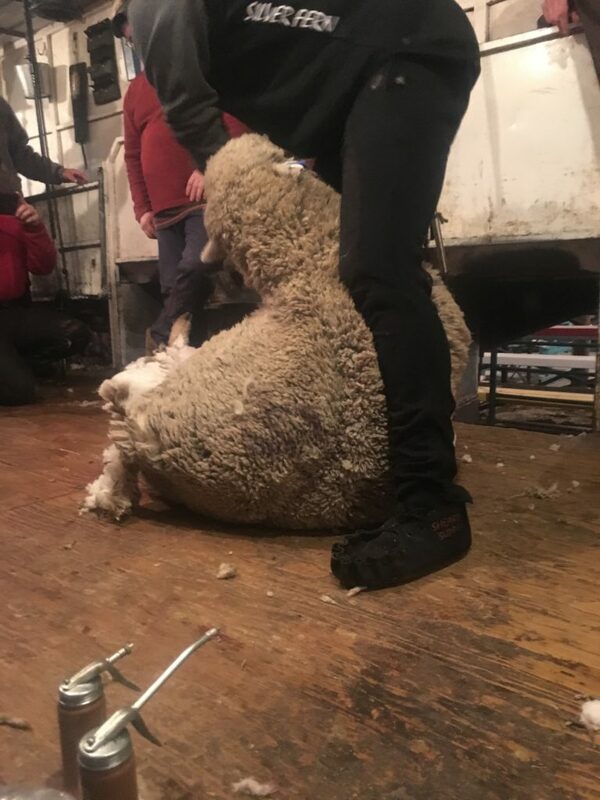 Another pro tip for this stage of shearing: On your blows up the spine, the bottom teeth should land where the tip of your middle finger on your left hand is. This sounds like I’m telling you to aim for your finger, and I’m not. What I mean to say is: When you’re finishing the left hip, doing those blows from the tail up the spine, and your left hand is pulling and rolling the sheep toward you so that you can reach to and over the sheep’s spine, the fingers of your left hand are pointed at the floor. The imaginary line that would extend from the tip of your left middle finger across the sheep’s back is the depth for which you should reach with the bottom tooth of your comb. And now, a few words about neck blows. The above is the correct positioning for the neck blows. The sheep’s chin is at a 90-degree angle to it’s neck, a normal position (vs. the sheep’s chin being pulled back, akin to our walking around with our chins high in the air, which is neither normal nor comfortable). Mike showed us how to pull the skin on the chin up to tighten it (much more comfortable for the sheep and its breathing), and NOT pull the chin itself, as some instructors teach, in the “Pull the chin taut and get through it quickly” school of thought. All shearers know, or should, that the greater the sheep’s comfort, the less it fights, and the easier the shearing is as a result. Shearers have every incentive to keep sheep as happy and comfortable as possible, and this is one more way to do so. But this is the most difficult footwork position for me, and always has been. This is because I am terrified of cutting the sheep’s neck and shoulder. So my WRONG AND ILL-ADVISED modification has been to push all of that sheep’s weight out in front of me during the neck blows, more akin to the position of shearing the last side. This puts all four of the sheep’s legs in front of my right leg, and all of the weight (on the sheep’s hip in the above photo) bowed out in front, supported–but NOT well controlled–by my right leg and left forearm and hand. The upshot is that these maneuvers stretch the front shoulder skin out nicely, but that’s about the only benefit of my mangled, ugly dance. I don’t have enough control, the sheep feels like it’s falling forward and about to collapse toward the ground (because it is), and the sheep kicks because all four of its legs are totally free to do so. Joy. So let’s talk about what we should be doing on a wrinkly, fine-wool neck as taught at this advanced school. 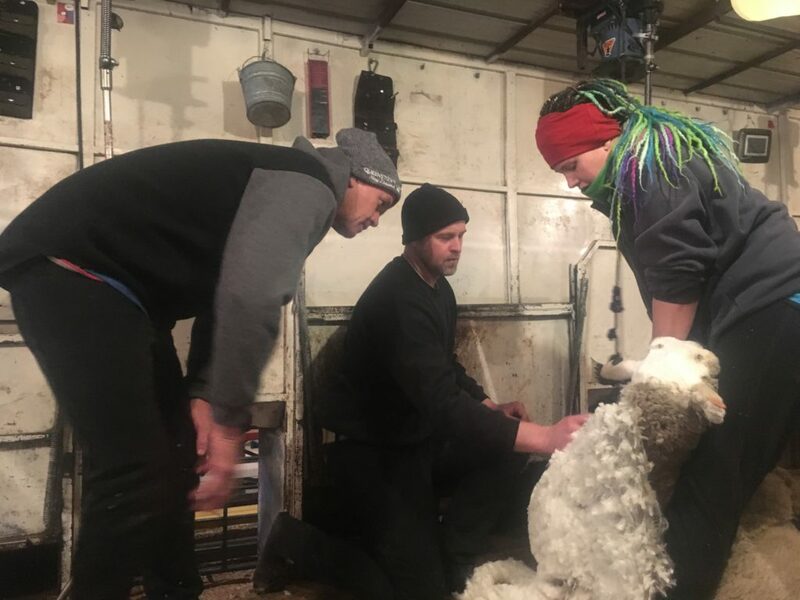 In the photo above, the great Emily Chamelin (AKA Lady Shearer Prime) has the sheep in the correct position, and Mike Pora (left) and Alex Moser (right) are talking about the pressure of comb teeth and the dreaded wrinkle. 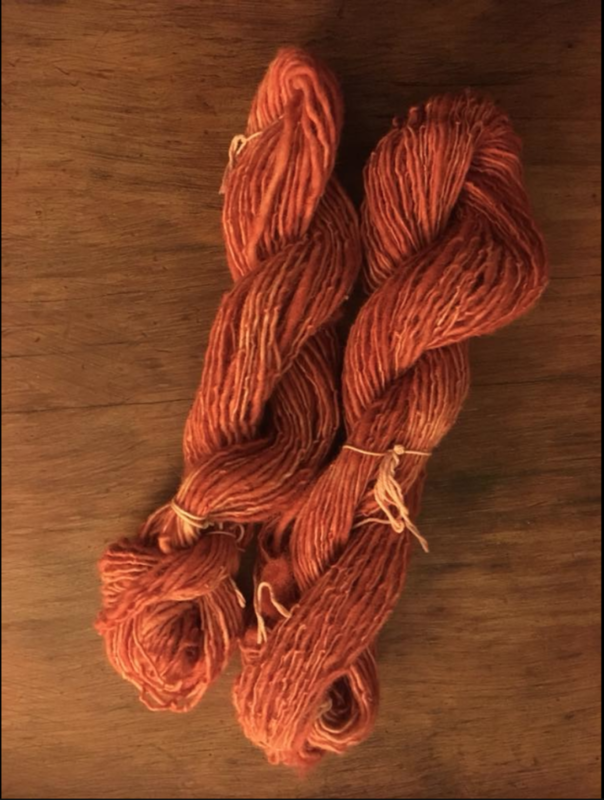 Fine-wool sheep (Merino, Rambouillet, etc.) have a wrinkle like a wattle, and shearers take great care not to cut it. Mike showed us how, on the first neck blow, you want the comb pressure on the top teeth and, on the second blow, on the bottom teeth. This effectively leaves you shearing each side of the wrinkle and not cutting it. This is a very subtle, nuanced and important technique. I have been using a neck blow modification that has worked well so far, and that Matt Gilbert taught me especially for wrinkly-neck fine wool sheep. I may continue it even after this class, but will devote time to practicing Pora’s method. Matt’s modification is to turn the sheep’s head to move the wrinkle. You can get an idea of this using your own neck. Look straight ahead, and turn your level head all the way to the left. The skin on the right side of your neck is smooth, and there’s a wrinkle on your left side. So, you would shear the smooth, right side, where there’s no wrinkle to worry about. When you turn your head to the right, the wrinkle is on your right and your skin is smooth on the left, so you shear the left. This cleans the neck in two wide passes. Now, let’s talk about the long blows. Notice how the sheep is on its back more than on its side, and that the sheep’s right shoulder and brisket are against the shearer’s left shin. This creates more control of the sheep. I have not been doing this properly. I hate to admit that, after six years of shearing (and not enough sheep), I sometimes still turn the handpiece off, walk the sheep into this position, and start up the machine again. The pros spin the sheep around and, as it lands in this place, take the first blow without skipping a beat. Sometimes I do that, just not as often as I’d like. Mike asked a good question: “Stephany, what does a hay bale do on its end?” “It spins,” I said. And there’s the wisdom. If the sheep is sitting on a small point, and holding enough of its weight, you can basically pivot/spin it down into the long blow position, voila (with an assist from lanolin). Another lesson I will implement right away is the six-sheep focus technique Mike taught: Pick one improvement to focus on (like a certain footwork position, or maybe the comb pressure on the sides of the neck wrinkle, etc. ), focus on that for the next six sheep, pause, evaluate how you’ve done and what you need to fix, and shear the next six sheep. My self-assigned homework is to find some sheep to walk around with. If I had my own sheep, I would do nothing but walk them through each position with only my legs, hands free, until I got every bit of the footwork right. Shearing jobs don’t lend themselves to this, as the job needs to get done, but I’m thinking of asking some friends to let me walk their sheep around with my legs for a day. This is why we take time for things like school, though: we can practice at school in ways we cannot on a paid job. 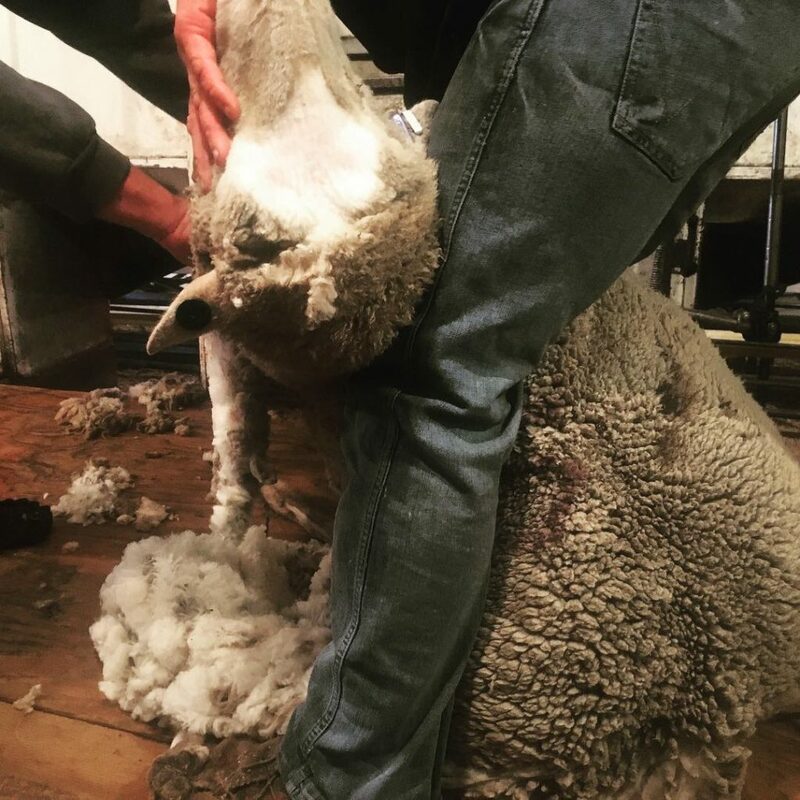 I can’t cover everything I learned in just a few days, but I hope this post inspires other shearers to take a course with Mike Pora, the master of nuance and finesse. And good heavens, it was gloriously beautiful. That’s a sentence I never expected to type. A couple of years ago, I started organizing notes, journal entries, and voice notes recorded during long hours of driving into a book, and the supportive, lovely folks at Oregon State University Press are publishing it. It’ll be out in October 2018. Erin Kirk New designed the beautiful book cover. My book cover, featuring my own photography. Ain’t that something? It’s available for preorder at Amazon. Can I come shearing with you? Peak shearing season (January through June) has reached its halfway mark, though many folks perceive March and April as its beginning. 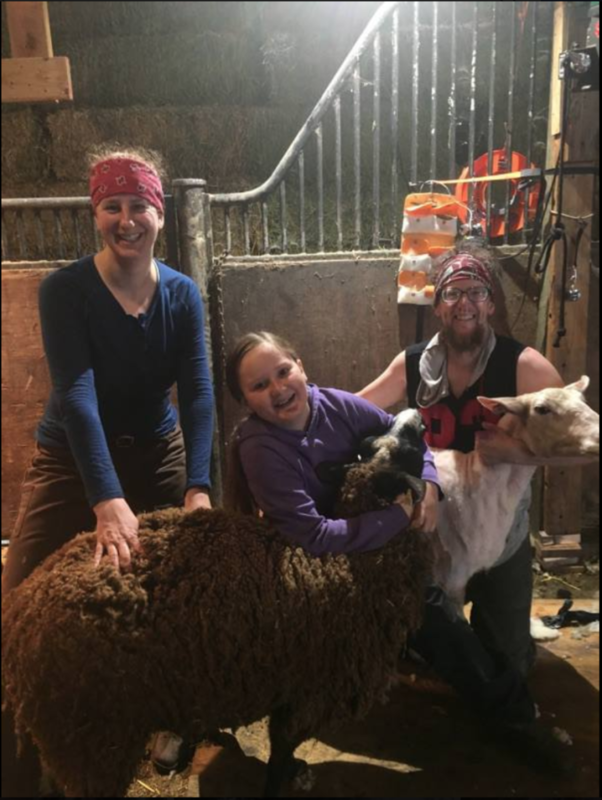 This is the time of year when I receive a surprising amount of email along the lines of “Can I come shearing with you?” Given the volume, I figured it was worthy of a post. Before you read the answer, know that most people do not like my responses. They say I am mean, and point out that Jordan took me shearing with him. Yes, he did…after I had two years at shearing school (10 full, 8-hour days of shearing and two certificates) under my belt. Probably not, with one exception: If you have attended shearing school somewhere at least once, live in Northern California, and have a flexible schedule, your chances are higher than anyone else’s. Reason #1: It’s my real job. Shearing is work. Yes, it is interesting, unusual work, but it is skilled, professional labor. My customers are clients. 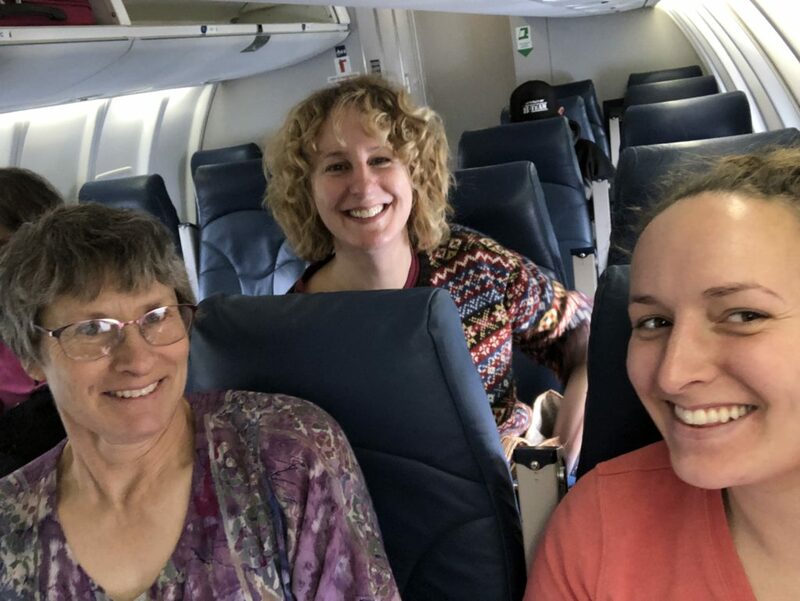 Asking to come shearing is much like asking “Can I tag along on that client website pitch?” or “Can I tag along on your nursing shift?” Shearing jobs are not (only) field trips. My customers want their sheep sheared cleanly and well. Most do not want to volunteer their sheep to be learned on, especially if they plan to sell the fiber. There are exceptions to this, namely meat sheep with short, coarse wool who are headed to the butcher. Their fiber wasn’t going to bring much money anyway, so it doesn’t matter if you reduce the staple length with second cuts as you learn. We all do that when we’re learning. This is why public shearing days (of the sort Meridian Jacobs holds) are so wonderful and worthy of attendance. They are designed to provide a full, shearing day experience, complete with fleece sale, with a team of folks managing everything else so the shearer can work. It is the best of all possible worlds. It is not easy to get into shearing schools these days, I’m told. The Hopland school I’ve attended sells out in less than five minutes each year, and schools across the country fill quickly. I know folks in California who have traveled as far as South Dakota, Canada, and Tennessee because those were the only shearing schools that had room. 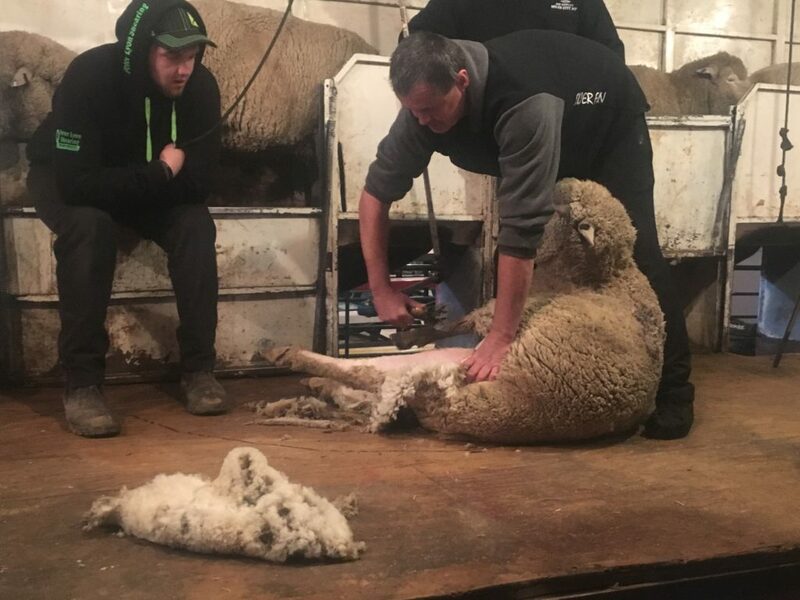 This is why it feels especially unfair to say: If you want to come shearing, it will be in an apprentice role, and you must have attended shearing school at least once, and gotten certified. Safe, humane animal handling, bodily memory of shearing moves, and equipment knowledge are prerequisites for coming shearing. I am glad there is more interest in learning how to shear, and love that I have more shearers to give work to than I did a few years ago. Yeehaw to that. In case you’re fortunate enough to have missed it, PETA has waged an anti-wool crusade for several years. They claim shearers skin sheep alive. To that I can only say: Pish. There are so many cleaner, easier ways to make a lot more money. 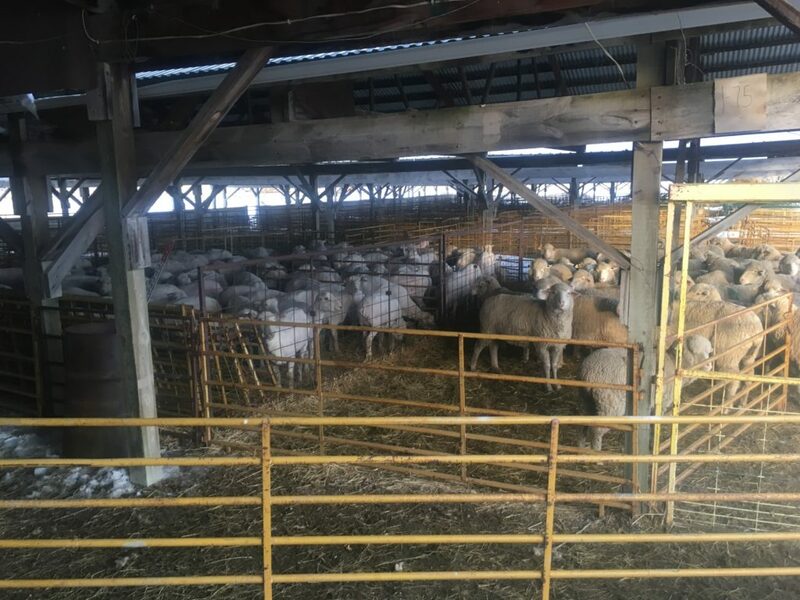 This anti-wool harassment–which targets ranches directly–means many wool producers understandably and justifiably do not want anyone who is not a known, skilled worker on their property (especially a person who likes to take video with their mobile phone more than work). It’s a sound approach, though it does make it harder to teach apprentices safe, humane animal handling and shearing. This is my sixth season shearing. Knock on shearing plywood, in those six years I have had to stitch a sheep once. It was a tiny nick, shorter than my thumbnail, but in a bad spot: the top of a belly vein. Of course, it was an accident, and required just a couple of stitches (fewer stitches than I have needed myself from work related injuries). The sheep bopped away and grazed and that was that, while I cried off and on for the rest of the work day like a real competent professional (not). Crying aside, it was a 15-minute event out of the 525,600 minutes in that year, and the 3,153,600 minutes in six years. Is this event representative of a body of work? No. Imagine that, in those 15 minutes, a PETA infiltrator has tagged along, knows the location of a ranch, and starts recording. The flock owner and I will be subjected to an online reign of terror and harassment for…how long? Months, years? Does it put the flock owner out of business? Do companies decide not to buy wool from them, to appease PETA? These considerations make it very risky to take a chance on a stranger. Most people have traditional 9-to-5 day jobs and, much as they might wish, cannot afford to take full weekdays off to come shearing with me. If they can, they often have family responsibilities that mean they must get back home at a certain time. Given Bay Area traffic, this often means they might only be able to be on-site shearing with me for 2-3 hours. When weekends roll around, folks are not exactly eager to wake between 4:30-6 AM so that we can reach a shearing site by 7 or 8 AM. Weather, sheep, and customers drive shearing dates more than my availability (for existing customers, anyway, who get and keep their annual slot for as long as they wish). If we’ve managed to find a date and time when someone can ride along with me, and it rains, they may not be free on the rain date scheduled for the following week (or month). In the past three years, I actually agreed to take certain folks shearing with me. I’d call or text to offer dates, and they either said they couldn’t make any of them, or said they could and, when I called or texted with a reminder 24-48 hours before the job, bailed. I don’t have the time for that additional management or the space for that mental overhead. This is not to say everyone is like this, but it happened more often than not. I try very, very hard to shear at dates and times that work best (not just those that work, but work best) for my customers. Which brings me to a related, unflattering, and possibly controversial point about perceptions of farmers, and how we value their time and agricultural work in general: Unskilled labor, however well intentioned, is not necessarily valuable – or, if it is, is not without costs – to a skilled farmer. As anyone who’s worked on a team in any sort of job knows, when a new hire joins, they don’t ramp up to 100% on day one. They need training and on boarding, and it takes a LOT of time to set someone up for success. When I managed engineering teams, I was simultaneously desperate for more help, yet had no idea where I would find the hours to give a new person the time and attention they deserved – even though they have some experience and know the field. Conceptually, we get this. This is why we have managers and apprenticeships. We willingly invest time in people, at least partially because we expect those folks to stick around for a while. But farmers, I think, we see a little differently than the engineering manager. Sometimes, the way we talk about farmers sounds like the way some folks speak about poor people: They should be grateful for anything we choose to give them. Farmers must be so desperate for someone, anyone to show up, even just once, inconsistently, when it’s most convenient for us, like on Sundays (but not every Sunday, I have weekend stuff to do), and never mind if the farmer wants to go to church or a picnic, while needing a ton of the farmer’s direction and time, and never mind the risk to animals or risk of injury. The person making the offer is in a position of power, in a way, in that they want to call the shots, whether it’s about the clothes they’re donating or the sort of farm labor they’re willing to do, and when. Even though we’re ostensibly giving something to someone (whether clothes to poor people or labor to a farmer), we get something in return: a tax deduction, in the former case, and time in the fresh air with animals, on a farm, outside of a city, exercise, and instruction in the latter. It’s an exchange, and we should strive to keep the exchange fair to the farmer: Farmers should not give us more than they receive, as they are already often giving all they can and then some. And, if the farmer is giving us more (instruction, valuable knowledge, life skills), we should recognize and appreciate them for that, not the other way around. This is another reason I like the Meridian Jacobs Farm Club: You pay for membership, products, and the privilege of learning from a real farmer – and it is a privilege.